It’s a highly miscellaneous Ask DST, with Diamond Select Toys president DSTChuck! He’ll field questions from all over the word of horror, fantasy and sci-fi, and his answers will horrify, fantasy-fy and sci-fi-ify you! Submit your own questions up above! Any chance for a Dredd 3D figure? Since its release in home video, it has become a cult classic. DSTChuck: Sorry, we have no plans right now for Dredd products. I would hope we’ll have a good spread of new stuff to show at Toy Fair in February, with more at C2E2 in the spring. Should be lots of new stuff to see from us in the next six months as 2014 heats up. Are there any plans to make 7″ figures from Supernatural or from Grimm? And please please please consider making a Doctor Beckett figure from Stargate Atlantis. My other Stargate figures miss him terribly. DSTChuck: Right now we have not talked about either show. We’d love nothing more than Stargate to come back to TV or movie or even DVD, if there is any action on the property we’ll be ready. Hello Chuck. Today I am going to bug you about Knight Rider. I saw that BBTS is now taking orders for KARR and I am very excited about getting one. I love the two tone paint scheme of that version and thought that Paul Frees voice work was great. I hope that is the voice you are going with for this version. Are there any plans to do a first appearance KARR that is all black and features the voice of Peter Cullen? Maybe as an Exclusive? Also any plans to add a Garth Knight figure in with any version of KARR? DSTChuck: I think for now we have plans for just one version of KARR but you never know. We do not have any plans for more figures at this time, sorry. Why wasn’t Stargate series 5 figures, more importantly General Hammond, released? Very disappointed they weren’t. DSTChuck: While there are lots of fans still out there for Stargate, the interest in retail dropped off. I think with the end of SG1 followed by what some considered the sudden cancelation of Atlantis, followed by no new show or any media was just more than the line could absorb. It’s too bad we had more plans for the line and as a show I thought Atlantis was really hitting it. Have you guys ever heard of ACBA (Articulated Comic Book Art)? I would describe it but it’s just so much easier to show you guys. I noticed that a lot of people who contribute to your photo contests are actually well known in the ACBA community. I would love to see a Diamond Select / ACBA contest! DSTChuck: DSTZach handles all of the Facebook contests, so I’ll pass this on to him. I’m writing to inquire if Diamond Select is planning to release a Universal Select Wolfman figure, and if so, when this figure would be available. Do you have any plans of creating a C3PO bust bank? You have other iconic favorite characters. C3PO is sorely missed. He was there from episode 1! Thank you so much. DSTChuck: Back several years ago we worked up a prototype for R2 and C3PO, but it was not well received. Now that we have more banks out there I think a 3PO could be possible. 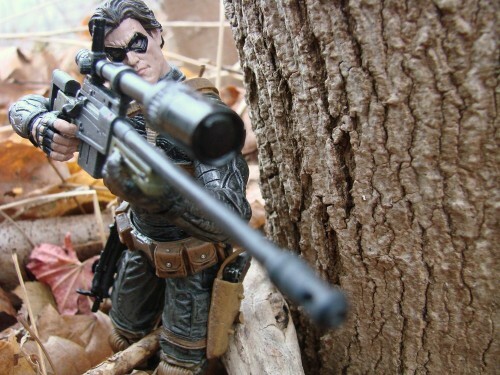 Next Up: Winter Soldier Hits the Disney Store With New Action Photos!